Clotting and bleeding are major causes of mortality and morbidity during high risk ECMO therapy that treats the “sickest of the sick” by infusing patients with oxygen-rich blood drawn from an ECMO circuit. One key component of an ECMO circuit is the oxygenator. As a clot develops in the oxygenator over time, the volume of oxygenated blood decreases and less oxygen-rich blood is delivered to the critically ill patient. If the clot gets large enough, the oxygenator will need to be switched out by the perfusionist as quickly as possible and replaced by one that will continue to oxygenate the blood. 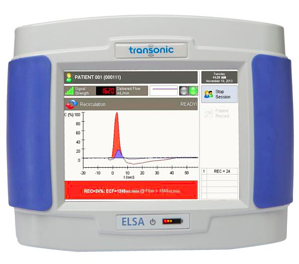 Now, a recent study, performed at Washington, D.C.’s Children’s National Medical Center and published in Perfusion, has confirmed that OXBV measurements with Transonic’s Extracorporeal Life Assurance (ELSA) Monitor directly measure the volume of clots formed within the oxygenator. In contrast to unreliable pressure gradients, currently used to track clot growth, a decline in oxygenator blood volume tells the intensivist that a clot is forming and growing within the ECMO oxygenator in time to make adjustments and avert emergent change-outs. The validation study consists of two parts. First the accuracy of OXBV measurements is tested on the bench by measuring the transit time of a bolus of saline passing through the oxygenator and recorded by a Flow/Dilution Sensor placed after the oxygenator on the ECMO circuit. The second part is an in vivo experiment in six newborn lambs undergoing Veno-Venous (VV) ECMO. A total of 88 ELSA ultrasound dilution measurements was compared with actual volume changes from the injection of fixed known volumes (from 5 to 40 mL) of petroleum jelly (Vaseline) into oxygenators to mimic the formation of clots of varying sizes. From their results the clinicians concluded that ultrasound dilution technology and the ELSA can accurately and reproducibly assess the clotting process in an oxygenator through its OXBV measurements. The ELSA Monitor with its OXBV measurement capability now gives ECMO teams an exciting new tool to help optimize ECMO therapy.